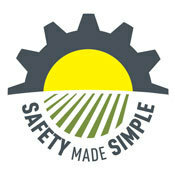 In support of OSHA's 2019 Stand-Up for Grain Safety Week, Safety Made Simple is making available our "Buried In Grain" online safety class as a free training resource again this year. This course is available in both English and Spanish. We encourage you to forward this training resource to colleagues or friends in the grain and/or agriculture industry as part of our combined efforts to send people home safe every day. Safety Made Simple fully supports the efforts of the NGFA, OSHA, the Grain Elevator and Processing Society, the American Feed Industry Association and the Grain Handling Safety Coalition which are working together to raise awareness of industry and OSHA resources available to identify potential hazards at grain, feed and processing facilities through the Stand-Up for Grain Safety Week. If you would like more information on our agriculture specific online safety training, please contact us to schedule a demo and learn more. Let us help you make sure your employees go home safe every day.